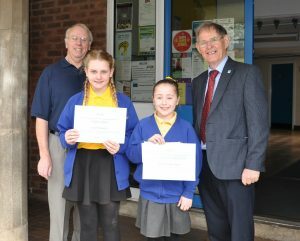 Rotary have recently been delighted to present awards to the winners of our Young Writer competition. The theme was ‘My Inspiration’. Although all schools were invited to take part, only two responded – Ysgol y Lan and Ysgol Bro Carmel. Over 50 entries were received, and our thanks go to all the children for their hard work and effort. 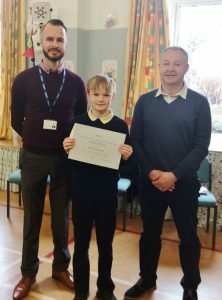 The Ysgol y Llan, Whitford winner was Fred Phillips, who was inspired by the experiences of his great grandfather as a soldier in the First World War. Fred had obviously done some considerable research. As well as the school winner, his script goes forward to the Rotary District, and we have just been told that he is the winner at this level as well. Our Rotary District covers all of North Wales, the Wirral and Merseyside, and with 57 Rotary Clubs, this is a tremendous achievement. The picture shows Fred with his certificate presented by President David Roberts. Headteacher Mr Brian Griffiths is with them. There were two winners from Ysgol Bro Carmel. The script from Maddie Humphries was judged to be the best to go forward to the District. Maddie wrote about how she is inspired by the gymnast Ellie Downie, as gymnastics is her passion. Although losing out to Fred, her script was judged to be “highly commended”. The overall winner was Olivia Wilson, who produced a spectacular poem about how she is ‘inspired’ by her family. 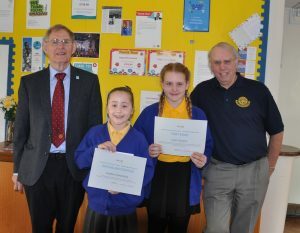 The picture shows Olivia and Maddie with Rotarians Rob Board and Kevin MacIntyre. Rotary would like to sincerely thank teacher Mr Nathan Williams at Ysgol y Llan, and teacher and Deputy Head Miss Nicola Jackson at Ysgol Bro Carmel for all their hard work in helping their children in this competition. Hopefully this competition will appeal to more school to take part next year.